This tutorial covers the basics concepts of balanced tree in data structure it means avl tree. Different concepts of avl tree such as avl tree balance factor, avl tree example, different avl tree rotation with example have been explained. 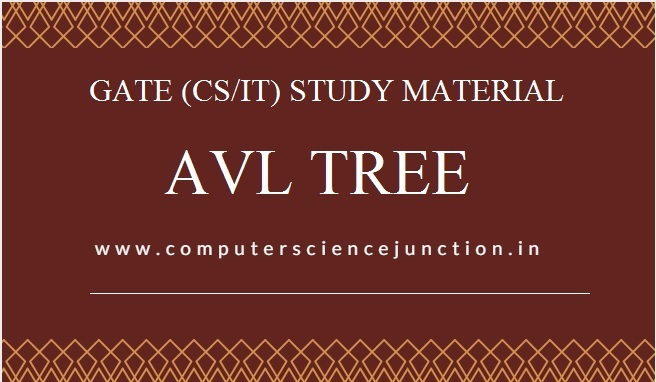 What is AVL Tree ? AVL stands for ADELSON, VELSKI AND LANDIS. It is a tree representation commonly known as ‘AVL TREE’.Here we have explained an avl tree example in the figure. 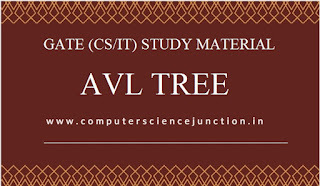 AVL tree is just like a binary search tree(BST) but it is a balanced tree in data structure. Here the the term balanced is used in context of height it means AVL Tree is a height balanced tree.in data structure. It is heught balanced binary search tree.If in binary search tree, at every node avl tree balance factor is 1 or 0 or -1, then it is AVL tree. In the above avl tree example the balance factor of node A is 1 and balance factor of node B, C,Dand E is 0. Why do we need AVL Trees? If the height of binary search tree is h then most of the BST operations take O(h) time to perform. So if, we manage the height of the tree remains O(logn) after every insertion and deletion, then the upper bound will beO(logn) for all BSToperations.The height of an AVL tree is always O(logn) where n is the number of nodes in the tree. Hence, it has complexity of O(logn). 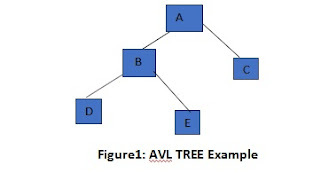 How can a tree be represented as AVL tree? First and second rotations are single rotations and the next two rotations are double rotations. NOTE:- To represent unbalanced tree we atleast need height as 2. When a node is inserted into the right subtree of the right sub tree then it become unbalanced. Then this problem is known as “RR- PROBLEM” and to make it balanced we perform a left rotation. An avl tree rotation example for left rotation is explained below. In our example, load factor of node A is 2 so it is unbalanced as a node is inserted in the right subtree of A's right subtree. SO in order to make the tree balanced we perform the left rotation by making A the left-subtree of B. When a node is inserted in the left subtree of the left subtree of Root Node then it become unbalanced. This problem is known as “LL-PROBLEM” and to balance this tree we perform a right rotation. An avl tree rotation example for right rotation is explained below. If we insert a node in right of left subtree of root node then it become unbalanced then we performed Left Right rotation. Here is avl tree rotation example for left right rotation. As Shown in above figure When we insert a node in the right of node q then it become unbalanced. Here in this case we need to perform two rotation as shown in figure to meake the tree balanced. When a new node is inserted in the left of right sub tree of node P as shown in following figure. Here also we need to perform two rotation. Here is avl tree rotation example for right left rotation. In the next post we will learn about insertion and deletion in AVL Tree.